Capno 101: What is Acute Respiratory Distress Syndrome? Capno 101: What is Opioid-induced Respiratory Depression? Capno 101: What is Asthma? The use of waveform capnography continues to expand across the EMS market. We had an opportunity to ask David Giarracco, vice president of patient monitoring at Covidien Respiratory and Monitoring Solutions, a leading global provider of health care products; and David Rowe, senior product manager in the capnography division for Philips Healthcare, their thoughts about the current state of waveform capnography and future trends for its development and use. David Rowe is product manager for gas and capnography consumables at Philips Healthcare, a leader in cardiology with a strong presence in cardio-pulmonary, oncology and women’s health. Rowe has over 25 years of experience in patient monitoring, point-of-care diagnostics, medical IT and consumables. David Giarracco is the Vice President, Patient Monitoring at Covidien Respiratory and Monitoring Solutions, where they’re passionate about making doctors, nurses, EMS, and other medical professionals as effective as they can be. Through ongoing collaboration with these medical professionals and healthcare organizations, they identify clinical needs and translate them into proven products and procedures. Giarracco was a trained basic science researcher at The Johns Hopkins School of Medicine and has over 20 years’ experience in delivering clinician centered, life-saving solutions for hospitals, chronic care and emergency services. EMS1: What do you believe are the biggest developments in waveform capnography in the past 5 years? COVIDIEN: The ability to sample both intubated and non-intubated patients, from neonate to adult, with a monitor that provides etCO2 values with crisp waveforms, even in the presence of higher FiO2 and/or the use of CPAP. The use of capnography in the EMS environment has expanded from CPR and manual ventilation, to use in spontaneously breathing patients in every clinical application, across the continuum of care. The addition of algorithms and technology like IPI (Integrated Pulmonary Index™) has also helped to provide information on patients’ adequacy of ventilation, helping clinicians recognize respiratory compromise earlier so they can provide intervention sooner. PHILIPS: Miniaturization, sensor robustness, ease of use, and clinical education have made waveform capnography an integral part of patient care worldwide and has now been recognized as fundamental to patient safety. The 2010 AHA guidelines endorsing waveform capnography as a Level I recommendation for ET tube verification, a Level IIa recommendation for detecting return of spontaneous circulation, and a Level IIb recommendation for monitoring CPR quality have provided additional impetus in adoption of waveform capnography in EMS applications. EMS1: What are some key questions departments should ask of themselves when considering the replacement or incorporation of etCO2 devices? COVIDIEN: Departments must consider how the patient populations they serve are changing with time. Do I have access to monitoring technologies that can give me insights into the ventilation status of these patients? This is especially critical when you don’t know the status of the patient — what medications do they have on board? Are they taking any other drugs? When I select a monitoring platform, is it robust enough to deal with all the patients that I treat in my practice, and does it simplify my workflow to be more efficient and more focused on my patient? Can I get this monitoring technology in multiple form factors so I can standardize across my department, my service or institution? Can I ensure that this patient links to our medical information systems? How will I comply with all applicable regulations and standards? Will my capnography choice support the evolving clinical guidelines and recommendations? Can I use it in all patients for whom I think it is clinically necessary? PHILIPS: Several factors need to be considered when choosing the appropriate capnography equipment. Some of these factors include: Ease of use? Portability? Manufacturer's warranty? What is the accuracy and specifications of the monitored parameters? Will the device work on all patient types? Are the patient accessories available for all groups of patients? What are the acquisition and operational costs? Are there costs beyond the initial purchase? Are the accessories/supplies easily available? Will the device fulfill the needs of all internal stakeholders? Will the device communicate/exchange data? EMS1: Where do you think this technology is heading? What is the research telling us? COVIDIEN: Research tells us that capnography is increasingly important, not just for the intubated patient but for the non-intubated patient as well. There are clearer connections between what a capnography device measures and the linkage to apneic events. There is also emergent research that is beginning to look at the combination of etCO2 and rSO2 to refine our understanding of resuscitation. The technology is continuing to expand. There are opportunities to apply capnography monitoring to more patients across the continuum of care: from pre-hospital to emergency department, critical care units, resuscitation response team as well as on the general care floor, during procedural sedation and for patients on pain management medications. Additionally, clinicians continue to use capnography to better understand the state of the individual patient. PHILIPS: Time-based capnography is slowly becoming widely adopted as a standard of care and an essential tool for the clinician. Meanwhile, research studies are showing that when time-based capnography signals are integrated with flow and volume signals, additional vital insight into the status of the cardiorespiratory system can be gained from volumetric capnography waveforms. Waveform capnography — when combined with airway dead space, alveolar dead space, physiological dead space ratios, effective ventilation indices and even cardiac output from volumetric capnography — is being shown to help measure effectiveness of CPR. These measurements may be especially useful in patients with lung disease such as acute respiratory distress syndrome and chronic obstructive pulmonary disease, and even asthma, as seen commonly now in EMS. EMS1: Are there pitfalls to avoid, and pearls to remember, when using the devices themselves? PHILIPS: Most capnography devices available in the market now have become really easy to use. The key to good capnography waveforms is to be able to sample the gas at the nose or mouth with minimal dilution. Clinical education, combined with hands-on training, helps eliminate moisture and other factors that may negatively affect the accuracy of capnography measurements. American Heart Association (AHA) Guidelines for Cardiopulmonary Resuscitation (CPR) and Emergency Cardiovascular Care (ECC). Highlights of the 2010 American Heart Association Guidelines for CPR and ECC. Do you have a story about how capnography made a difference? Share your story with us and we may publish it on CapnoAcademy. 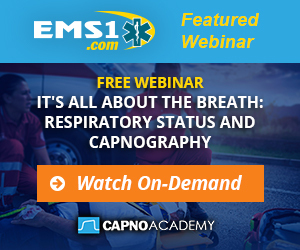 Gathering together the latest research, news, videos, and training, CapnoAcademy is the ultimate resource for EMS professionals interested in learning more about all things Capno related. Ultimately, it means better patient assessment, better understanding of a patient’s problems and how to best treat them. Share Your Capno Story With Us. © CapnoAcademy . All rights reserved.